A man caught carrying a knife in public for the third time has escaped being jailed. Jerry Murray was most recently caught with a lock-knife in Blackpool after previously being caught with a Stanley knife in 2005 and a butterfly knife in 2002. Murray, 43, of Hathaway, Marton, pleaded guilty to possessing a lock-knife in public. He was sentenced to 146 days jail suspended for 18 months and ordered to pay £85 costs with £115 victims’ surcharge by Blackpool magistrates who ordered the destruction of the knife. When challenged by officers Murray kept putting his hands in his pockets and would not take them out. Witnesses pointed out that they had seen Murray drop a bag nearby. Officers retrieved it and found a lock-knife attached to it. When interviewed Murray said he had drunk up to nine cans, taken crack cocaine, painkillers and his medication of the heroin substitute Methadone and that was the last he could remember. Stephen Duffy, defending, said his client had bought the knife at a local shop and it had a blade of just one-and-a-half inches. Murray had used the knife for jobs such as mending his son’s bike and cutting cable. He had not realised it was illegal for him to have that knife in public. Murray had been found in an intoxicated state at the side of the road and had never produced the knife from the bag in public. Nine anti-fracking protesters were told they had no case to answer after a judge criticised prosecuters over an “absence of evidence” put forward at trial. The hearing, which had been due to last five days, was called off at the end of day two. The group had been accused of willfully blocking Preston New Road as part of a protest outside Cuadrilla’s fracking site on October 1 and 2 last year. The court had heard the protesters locked on under metal tepees at the entrance to the shale gas exploration site at Little Plumpton. Giving evidence, Cuadrilla site manager Christopher Flint said 25 delivery lorries had to be cancelled. However the Crown was criticised by District Judge Jane Goodwin for not bringing evidence from the police or members of the local community about the effect of protest and whether or protesters were given the five-step appeal by police before their arrest. Judge Goodwin said: “I have looked at the tenuous nature of the Crown’s evidence and I find lacking in parts. “We know there was a police cordon and a contraflow but I do not know the reasons behind this and for how long they were in place. Liz Beck, 57; Hamish Haynes, 44; Theodoros Papadakis, 22; Fiona Smith, 46; Ellie Stanton, 25; Christopher Wilson, 57; Heather cross, 28, all of the New Hope protest camp, Preston New Road; Jennifer Harper, 52, of Maple Farm, Preston New Road; and Gordon Holian, 50, of no fixed address were all acquitted. A man was arrested after throwing punches at passengers on a bus. Sean Green was also seen scuffling on the floor with a man said to have pulled him off the bus. Green, 25, of Shaw Road, South Shore, pleaded guilty to being drunk and disorderly. He was given a 12 months conditional discharge and ordered to pay £50 costs with £20 victims’ surcharge. 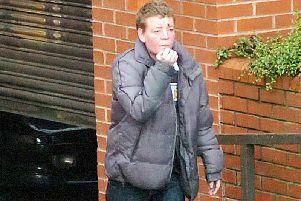 Prosecutor, Pam Smith, said police were called by a Blackpool Transport bus driver on March 5, to say a man was being abusive and throwing punches at passengers on the bus. Police arrived to see Green tussling with a man on the ground. On seeing the officers, Green ran off but was caught. Green told magistrates he was on the bus because he had attempted to harm himself and wanted help. He said there was only one passenger on the bus and he had called him a freak and a time waster after Green said he wanted an ambulance. Green said he had been pulled off the bus by someone he had known at school. There was a scuffle because that man had threatened him with a knife. He added that after this incident he had stopped drinking alcohol.